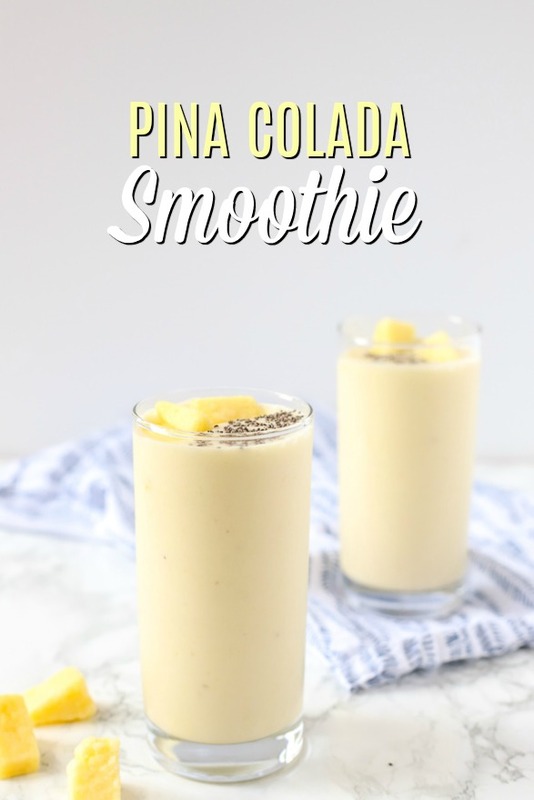 This Pina colada smoothie is a delicious and healthy drink that will bring you right back to the beach. 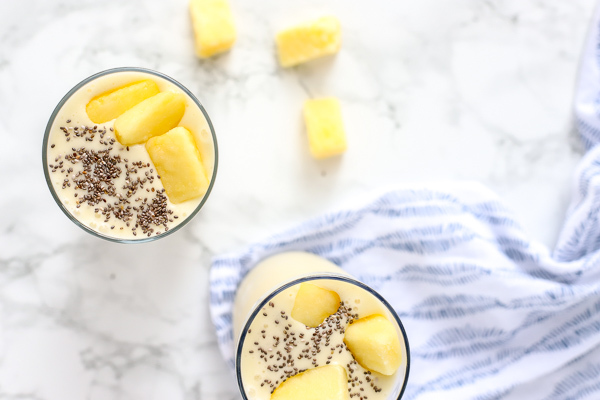 Full of tropical pineapple and coconut flavors, this natural pina colada smoothie recipe is simple and takes just four ingredients. Follow my tips below to make this delicious, beachy smoothie. There is nothing like a pina colada on the beach. The only problem, of course, is that I’m nowhere near a beach… well, that’s not entirely true. We are an hour from the coast, but our coast is not very warm. To give you an idea, it was 80 degrees there once when it was 110 in our town. The Oregon coast is definitely not tropical. So when I think of a beach, my mind goes to warm, tropical, white sand beaches with palm trees. After a long, rainy winter in the Pacific Northwest, a beach vacation sounds like something my soul needs. 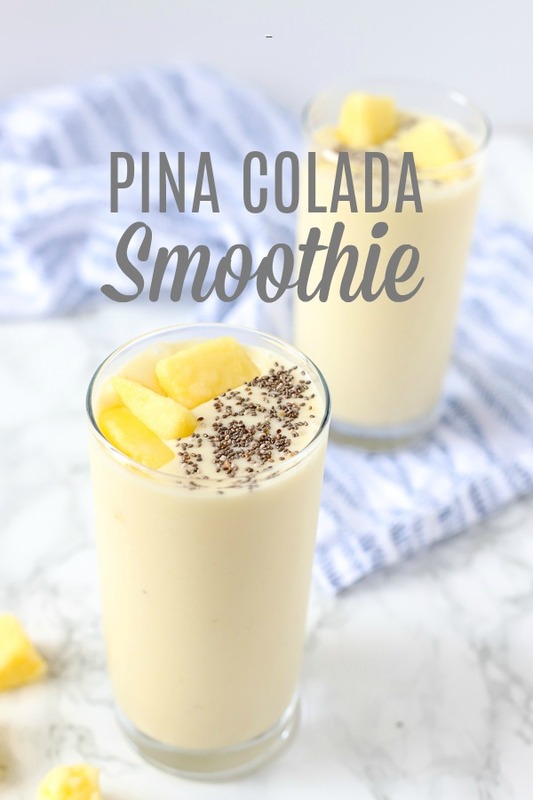 Even though I don’t have a beach vacation planned anytime soon, I can still enjoy this delicious, tropical pina colada smoothie and it will bring me back. Smoothies are a lost love language at our house. When I was pregnant with my first, I would pack a fresh-made smoothie every day with me to work. Once August was old enough, we would make them frequently; then number two came. With two kids underfoot, the idea of smoothies seemed liked such a chore. Why?! I have no idea, because once I made this, I remembered how easy it is to make (and clean up after) smoothies, and they’re so great for kids. We are now back to our almost daily smoothie habit. Usually, we try to put a veggie in it to make it even healthier. We love adding spinach, beets, and/or cauliflower to smoothies. Yum! 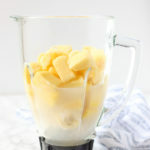 Also, you will be finding more smoothie recipes on the blog! Just you wait. 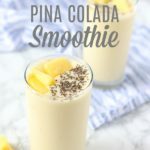 Is this pina colada smoothie healthy? Of course! Let’s take a look at each of the ingredients and why they are healthy. Bananas are high in potassium, but they also are full of other vitamins and minerals, and can help keep your blood pressure and cholesterol at a healthy level. Bananas also contain a good amount of fiber and contain pre-biotics. If you want even more of a coconutty flavor, you can add a couple spoonfuls of shredded coconut. 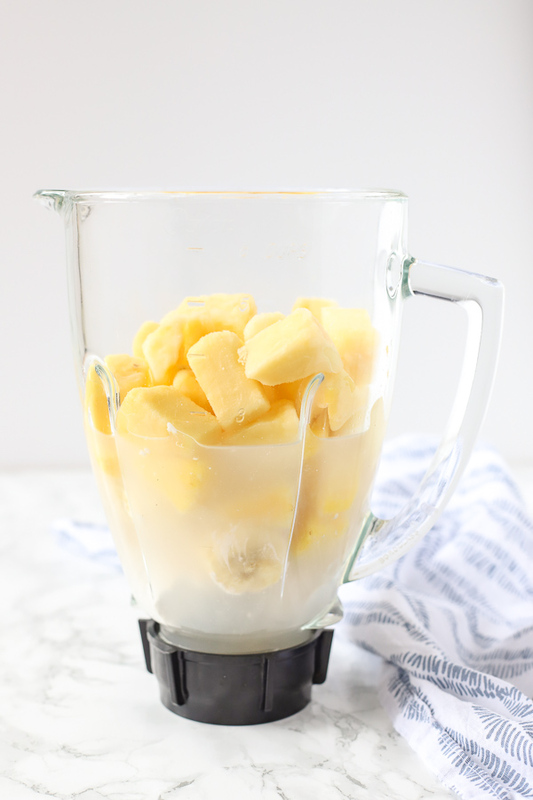 For a slightly different and delicious tropical flavor, swap out half the pineapple for frozen mango. Yum! Add in some of my favorite “extras” to boost the nutrition: collagen peptides, chia seeds, a scoop or two of yogurt, or a handful of spinach (it won’t be a pretty, light yellow anymore, but that’s okay!). You can swap out the honey for maple syrup. Add a splash of pineapple juice if you want a sweeter, stronger pineapple flavor. That’s why I love smoothies so much: they’re so customizable! You only need a few tools, nothing fancy. Just some measuring cups and a blender (I have this not so expensive one that I love). Love smoothies? 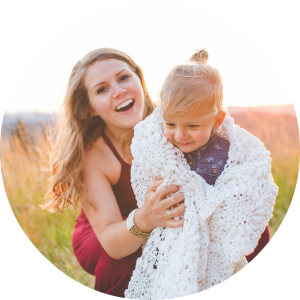 Check out some of my favorites! Berry beet smoothie is a delicious and easy way to eat your veggies. Homemade Monkey Milk is basically a smoothie, a light and fluffy chocolate and banana smoothie. Creamy Orange Mango Smoothie is another delicious and tropical smoothie. Blueberry Chia Green Smoothie is packed full of healthy ingredients. This Acai Smoothie from my friend Wendy sounds divine. All it takes is four simple ingredients to make this tropical smoothie everyone will love. If you try this recipe and love it, I would love if you came back and gave it 5 stars! 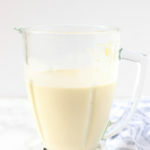 Delicious and creamy pina colada smoothie beaming with tropical flavors like pineapple, coconut milk, and banana. You could also use refrigerated coconut milk. It won't be as creamy.